Program requirements were met and signs installed March 3, 2012. Lee Brunell has taken over the role of Coordinator for the Citizen Patrol Group. Thanks to Cindy for the many years of service. Citizen Patrol training / re-certification classes are resuming on an as-needed basis. If you are interested in being trained / re-ceertified, please contact Lee Brunell (our new CP Coordinator) for details as paperwork needst to be completed and approved prior to attending class. See below for a link to contact Lee. The new training / re-certification dates for 2018 are being added to the calendar as they are received. Training is typically held monthly on the 3rd Thursday at 6 pm, at the HPD Westside Command Station. Dates occassionally change and will be updated on the calendar as we are notified. A background check form needs to be completed prior to class. Download a copy of the form here. Please contact Lee Brunell if you plan on attending the class. 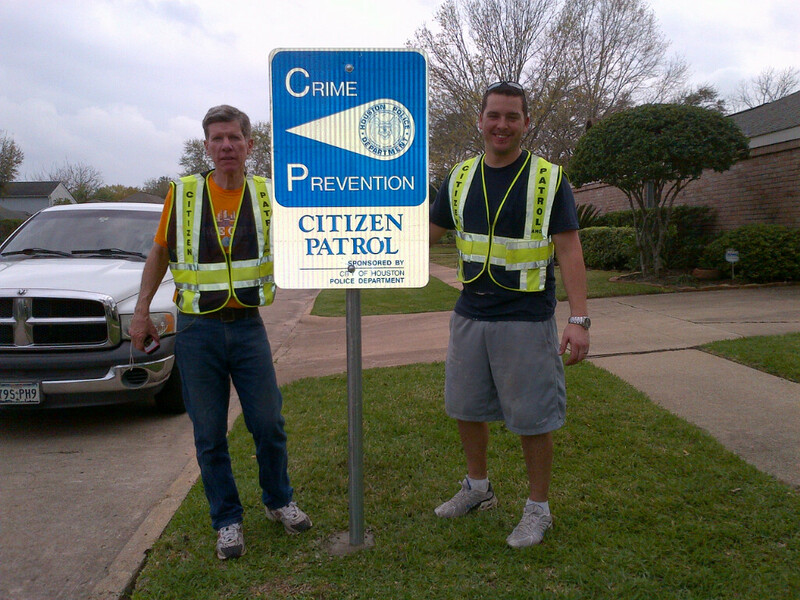 To promote a friendly and safer neighborhood environment while respecting the privacy and rights of all citizens. To encourage awareness and provide improved communication among neighbors. To upgrade the quality of life and property values in the area. Recommendation that at least 8 citizens participate in the program. If less than 8 citizens, approval from the Citizen Patrol Division Liaison is required. Commitment from the group to patrol a minimum of 30 hours per month. Submit a monthly report detailing the group’s activity. Submit a marked map outlining the area to be patrolled.